Business hours for the Springs Preserve Public Relations and Marketing team are Monday through Thursday from 7 a.m. to 6 p.m. If not on a tight deadline, media representatives also can contact us via email. Find a selection of our favorite photos below. Simply right click to download. If you'd like high-resolution versions of them, or would like other image options, please contact Dawn Barraclough at 702-822-7733, or contact us via email. Listed on the National Register of Historic Places since 1978, the Springs Preserve is a 180-acre expanse of land. It is located approximately three miles west of downtown Las Vegas. The site represents a rich and unique cultural and biological resource for Southern Nevada. Magnificent artesian springs here once nourished all fragile life – plant, animal, and human. Although the springs dried up in 1962, their role in Las Vegas history remains evident through artifacts and other archaeological clues. The first human imprint on the Las Vegas Springs dates back between 5,000 to 12,000 years. Generations of nomadic Native American tribes lived here seasonally, hunted small game, and drank their fill of the springs' flowing waters. Harboring visions of the rich California coast, Spanish traders of the early 19th century forged a path that became known as the Old Spanish Trail. Upon discovering this sanctuary, they christened it "Las Vegas," which means "the meadows" in Spanish. In the years that followed, the Las Vegas Springs welcomed weary travelers, explorers, traders, settlers, and missionaries – all of them drawn here by one common element: water from the springs. The enticing land near the springs was purchased by the San Pedro, Los Angeles and Salt Lake Railroad (later known as Union Pacific). This became the Las Vegas town site. It was water from the natural springs that powered the railroad’s steam locomotives. Acquiring the water rights with the land, the railroad established the Las Vegas Land & Water Company to manage the fledgling town site and its water supply. In later years, the Nevada Legislature created the Las Vegas Valley Water District. Among the Water District's inherited holdings was the Las Vegas Springs property, which remained relatively untouched. Today, while remaining a National Historic Site, the Springs Preserve has evolved into a $250 million, world-class attraction providing a glimpse of the true origins of Las Vegas. To assist you in fulfilling your media needs, this information sheet contains contacts, criteria, and guidelines for many requests. (Located between U.S. 95 and Alta Drive on Valley View Boulevard at Meadows Lane, across from the Meadows Mall.) We are located just minutes from the famous Las Vegas Strip, Downtown Las Vegas, and McCarran International Airport. Broadcast, print and social media news coverage or requests - Please contact the Public/Media Relations office to arrange your visit – 702-822-7733. Interviews - Secure and schedule interviews with staff and Preserve spokespersons as far in advance as possible. Nevada State Museum requests - Contact Dennis McBride at 702-822-8739. Non-news Film / TV / Print / Multimedia requests - Non-news related shoots are subject to prior review and approval and may be treated as site rentals subject to location fees. Springs Preserve location/talent releases must be signed by production company prior to shoot. All non-news requests must be made through our Group Sales department – 702-822-8779. Documentary, Non-profit requests - are subject to prior review and approval, requiring location/talent releases be signed by production company prior to shoot. Commercial and Personal photography requests - Must be scheduled in advance based on space availability, and location fee, if applicable, must be paid prior to photo shoot. 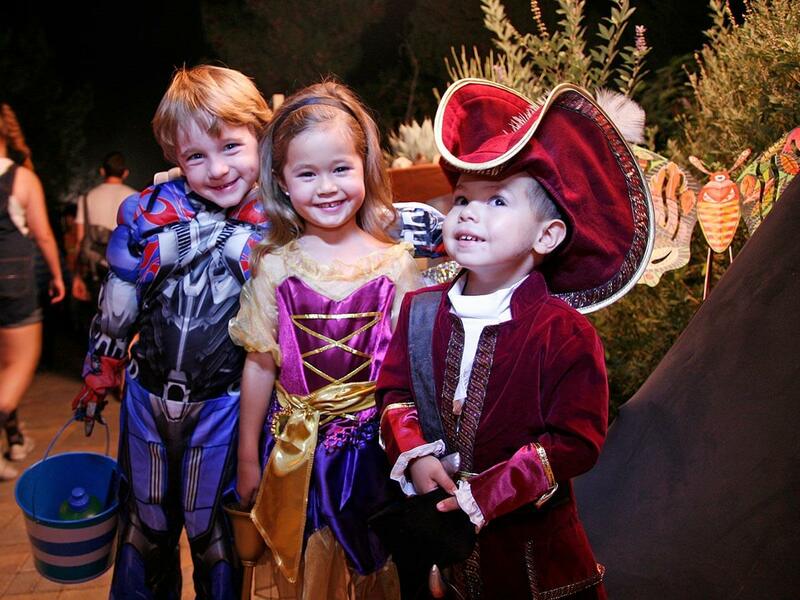 Make all photography arrangements through the Springs Preserve Group Sales department - 702-822-8779. On-line Newsroom: Images of the Preserve, fact sheets and other media materials are available on the Springs Preserve website. Historical images of the Springs Preserve site are available by contacting the UNLV Special Collections department at 702-895-2234.
Business hours for Springs Preserve PR/Media team are 7 a.m. to 6 p.m. Monday-Thursday; however, the team will try to accommodate requests made outside of this time frame (with sufficient notice). Dialogue Center 21,545 sq. ft.
Patio and Rotunda Gallery Areas 21,416 sq. ft.
Cottonwood Room/Banquet Room 20,445 sq. ft.
Sustainability Gallery 4,600 sq. ft.
Activity Center 3,232 sq. ft. Welcome Gallery and Information Center 1,901 sq. ft.
Terrace Gardens 1,696 sq. ft.
Gardens Center 200 sq. ft.
South Ticket Booth 100 sq. ft.
Nevada State Museum 78,145 sq. ft.
Origen Museum 49,610 sq. ft. Guest Services (Gift Shop, Nature Exchange and Cafe) 24,815 sq. ft.
Water Works (Pump Station) 24,140 sq. ft.
Total building space (incl. Nevada State Museum) - 247,845 sq. ft.
Boomtown 1905 - 4,700 sq. ft.
Children's Play Area - 14,336 sq. ft.
General information: The Springs Preserve is a 180-acre cultural campus, offering entertainment, education, and recreation. The Preserve is located at the original water source for the valley. It celebrates Las Vegas’ dynamic history and provides a vision for a sustainable future. History: The Preserve served as the original source of water for Native American living here thousands of years ago. Later, travelers on the Old Spanish Trail and Mormons who came to settle the west relied on it. The site was listed on the National Register of Historic Places in 1978. The Springs Preserve opened to the public in June 2007 and is celebrating its 10-year anniversary in 2017. Program highlights: Programming is focused on enhancing the desert living experience. It accomplishes this by providing family-oriented entertainment at a historic, sustainable site. 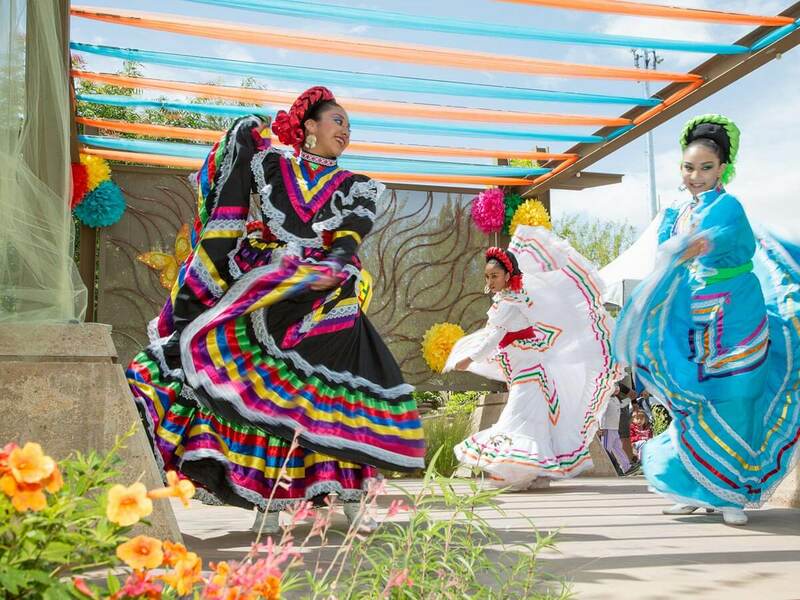 It includes educational and cultural classes, exhibits and live shows, as well as significant holiday events celebrating the diversity of the Las Vegas community. 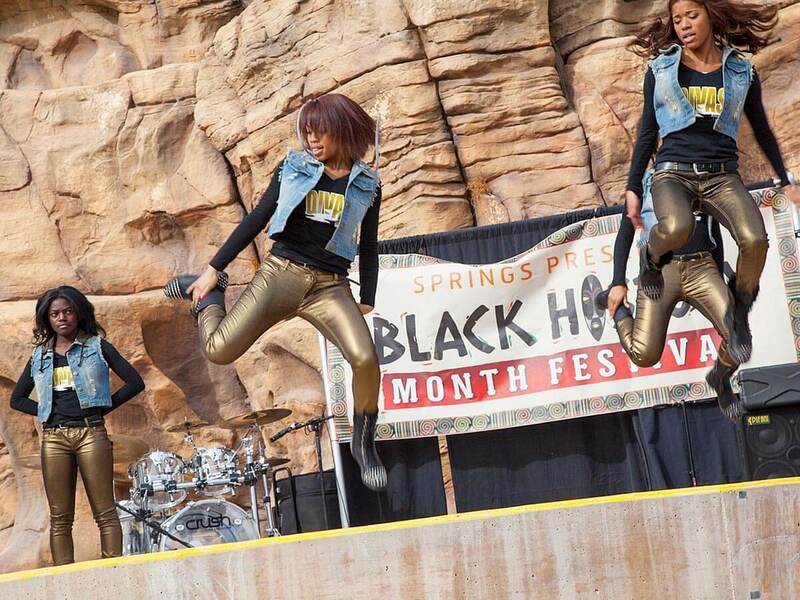 Experiential programs: Holiday events throughout the year celebrate the diversity of the Las Vegas community, such as the Black History Month Festival in February and Dia de Muertos in November. 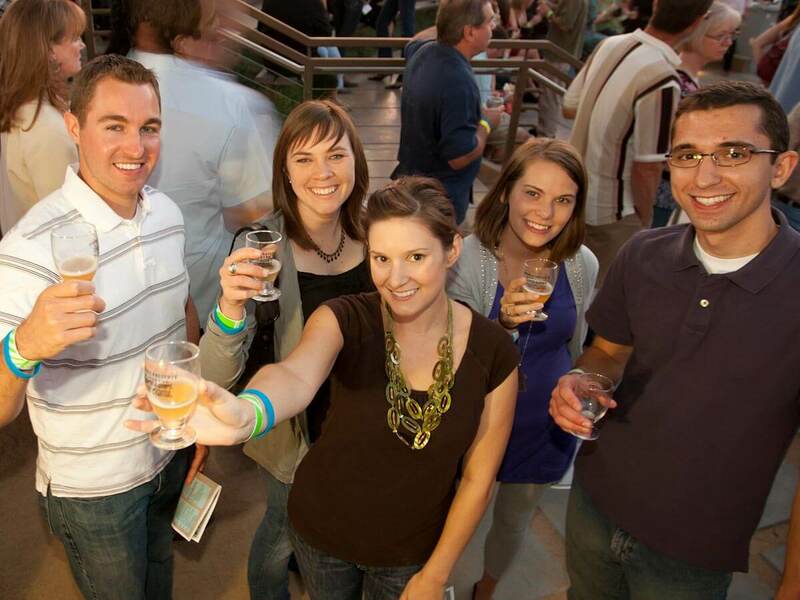 Run Away with Cirque du Soleil, Grapes & Hops, and the Ice Cream Festival are annual benefit events at the Preserve. 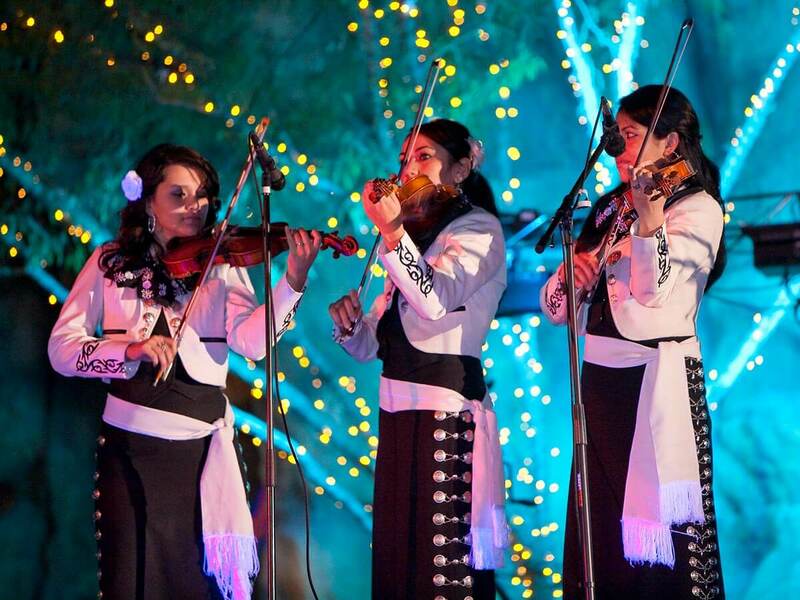 Live musical and theatrical performances, and gourmet food and wine events are scheduled as well. Interpretive elements scientific/research programs: As the location of the original water source for Las Vegas, the Springs Preserve is an archaeologically significant site. Artifacts from as early as 5000 BCE found on-site are interpreted. Native Mojave Desert wildlife research is conducted in conjunction with local agencies with a focus on threatened and endangered species. In partnership with Clark County School District, the Preserve hosts 30,000 students in field trips each year. Teachers can learn about the Preserve in a program called Teach the Teachers. The Preserve partners with organizations that provide services for under-served students. These includes Communities in Schools, After-School-All-Stars, and Downtown Achieves. In partnership with UNLV, DesertSol Solar home is permanently located at the Springs Preserve. The Preserve works with Boy and Girl Scout organizations. Operator/Governance model: Public/private partnership: The Las Vegas Valley Water District (LVVWD) is land owner and steward of the Springs Preserve in partnership with the Springs Preserve Foundation, a 501(c)(3) non-profit, tax exempt corporation established to further the mission of the Springs Preserve. The Foundation is governed by a Board of Directors committed to the Preserve’s long-term health and viability. Hours of operation: Year round 9 a.m. – 5 p.m. seven days a week. Hours vary for special events. The Preserve is closed on Thanksgiving Day and Christmas Day. *Please ask about discounts available to residents, students, groups, military, and seniors. Ticket purchase: Tickets to the Preserve, events, and classes can be purchased online at springspreserve.org or the day of your visit at the Box Office. LEED certification: The Preserve is one of the largest attractions in the United States to achieve LEED (Leadership in Energy and Environmental Design) Platinum Certification status. LEED is a sustainable, green building design designation from the U.S. Green Building Council. Other: The Preserve is wheelchair accessible. With the exception of service animals, pets are not allowed at the Preserve to ensure wildlife is not disturbed and to protect archeological artifacts on the site. No outside food or drink is allowed in the Preserve. Group Sales: Make the Preserve the setting for your next meeting or event by calling 702-822-8779. Volunteer: The Preserve has a Gardens and General Docent program with ongoing training sessions. Please call 702-822-7751 for more information. Donate: Support the Springs Preserve Foundation. Contact a Development Officer at 702-258-2429. More information: Visit www.springspreserve.org or call 702-822-7700. Project intent: Boomtown 1905 explores the critical role that water from the Las Vegas Springs played in the development of Las Vegas – from dusty desert watering stop to modern-day metropolis. The 'boom' began in 1905 when the San Pedro, Los Angeles and Salt Lake City (S.P.L.A.& S.L) Railroad completed its rail line, establishing a stop in Las Vegas and using water from the Las Vegas Springs to support operations. Thousands of people traveled to Las Vegas to participate in the railroad's famous May 15-16, 1905, land auction, conducted by its subsidiary, the Las Vegas Land and Water Company. In the hours and days to follow, successful bidders quickly went to work setting up businesses and establishments to support the growing community. The re-created streetscape of Boomtown 1905, complete with immersive exhibits in and around the structures, explores elements of daily life in the early railroad town and the rapid transformation that occurred here during the early 20th century. Planning and development: Boomtown 1905 represents the culmination of extensive design, restoration and construction efforts. The project was inspired by the 2005 relocation of four original railroad cottages from downtown Las Vegas and completed in 2017 with the final installation of exhibits. Project features: The exhibit includes four original restored railroad cottages that housed early railroad workers and their families (768-813 sf). The exhibit also features re-creations and representations of early businesses, including: the Las Vegas Train Depot (1,800 sf), the Lincoln Hotel (455 sf), the Arizona Club (665 sf), a mercantile (559 sf), the First State Bank (307 sf) and the outdoor Majestic Theatre (900 sf). Collectively, these buildings represent approximately 4,700 sf of new exhibit space. Project funding: The overall cost to relocate and restore the four cottages, and to design, develop and construct the Boomtown 1905 exhibit was approximately $6.5 million, funded primarily through proceeds from a Southern Nevada Public Lands Management Act grant for Parks, Trails and Natural Areas, sponsored by the City of Las Vegas. Other funding and professional assistance was provided by the Springs Preserve Foundation, Commission for Cultural Affairs, State Historic Preservation Office, National Park Service, J.A. Tiberti Family, Cashman Family Foundation, the Nevada Chapter of the American Public Works Association, Las Vegas Rotary and Wells Fargo. Train Depot: Step inside to learn how the railroad transformed Las Vegas from a dusty desert watering stop to one of the world's most exciting destinations. Here you'll also be able to try your hand at sending a message in Morse code using a telegraph machine, use a train whistle to alert townspeople, and catch up on the news of the day at a vintage newsstand. Railroad Cottages: The railroad cottages housed railroad workers and their families and were considered the finest homes in town in their day. Four of the 64 cottages built by the railroad in 1909-1911 were relocated to the Springs Preserve for restoration and preservation. Tour one restored to its original pre-1911 condition, listen to music from times gone by on an antique Victrola, see what's cooking for dinner and peek inside the bedrooms to glimpse furnishings of the day. The Lincoln Hotel: The Lincoln Hotel catered to some of Las Vegas' first tourists and railroad workers. Featuring Mission-style architecture, the hotel provided "good, clean beds" for as little as 25 cents. Check-in at the hotel, sign your name to the guestbook register and take a tour of the hotel’s "luxurious" accommodations. Majestic Theater: Town visitors and Las Vegas locals gathered at the Majestic Theatre to see the latest films of the day. Kick back and enjoy film clips from the early 1900s, when films were silent and black and white. The Preserve will present the "Airdome" version of the Theater, which was a place for outdoor films when the summer heat in the theater became too stifling for patrons. Arizona Club: The Arizona Club was the most famous gambling saloon in town. It provided train passengers and Las Vegas locals a place to unwind and kept drinks flowing during the dry days of prohibition. Step up to bar, try your luck with a spin of the roulette wheel, or relax in our barroom to the sound of a restored player piano. 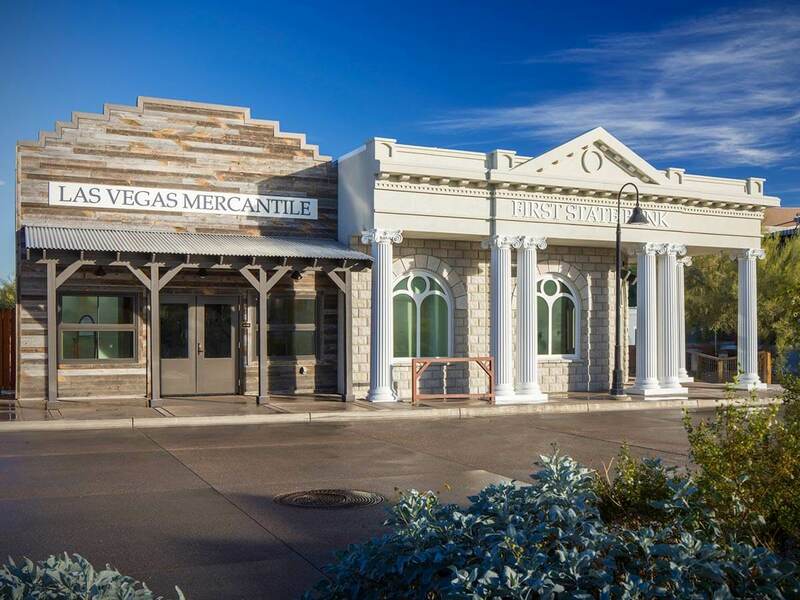 Mercantile: Mercantile stores provided a wide assortment of goods to Las Vegas residents. You could buy nearly anything including mining gear, food and fabrics. Explore a wide assortment of antique provisions, try on clothing of the day, weigh goods and ring up your selections on an authentic period cash register. How to get there: At the start of the trail head, Boomtown is a quick .25 mile (1200 ft.) walk north at the start of the Exploration Loop Trail. If you prefer to ride, train "transfer" tickets will also be available starting at 9:30 a.m. daily with the last transfer leaving Boomtown at 4:30 p.m. every afternoon. Full length train rides, which also visit historical and archaeological sites and native habitats, will be available every day 11 a.m. – 2 p.m. at the start of every hour. Train ride and train transfer tickets are available for purchase at the main ticket window, the trailhead and the Arizona Club. “Transfer” tickets are $2.00 for non-members, free for members, children 2 and under are free. Full length train rides are $5 non-members, $3 members, children 2 and under are free. Description: The Botanical Garden at the Springs Preserve (Preserve) is designed to be a creative learning environment. It invites visitors to explore native and non-native plant life that thrives in the desert. There are many informative stations and hands-on activities. Visitors can explore desert landscaping and ways to enhance outdoor space with water-smart techniques. The Botanical Garden contains thousands of native and desert-adapted plants. More than 400 mature trees and plants were transplanted to the Preserve, especially to the Botanical Garden. Some of these were 20 years old and over 30 feet tall. Many plants on display are native to the Mojave. These were grown from seed collected in the Las Vegas Valley, making the plants genetically true and well adapted to the climate. Almost all the native cacti and Yucca species were salvaged from local lands that were being developed for residential or commercial use. Gardens Classroom – Visitors of all ages can learn in our weekend classes. Topics include nature and the world around them, gardening, living in harmony with the desert, and more. The Gardens Classroom is a truly green building, with rammed-earth walls, passive cooling towers and solar-generated power. DesertSol – This permanent, walk-through exhibit is an award-winning 745-square foot one-bedroom, one-bathroom solar-powered home. It was created and built by the UNLV Solar Decathlon Team as part of the U.S. Department of Energy Solar 2013 Decathlon. It is an ultra-efficient showcase of innovation in sustainable home design. 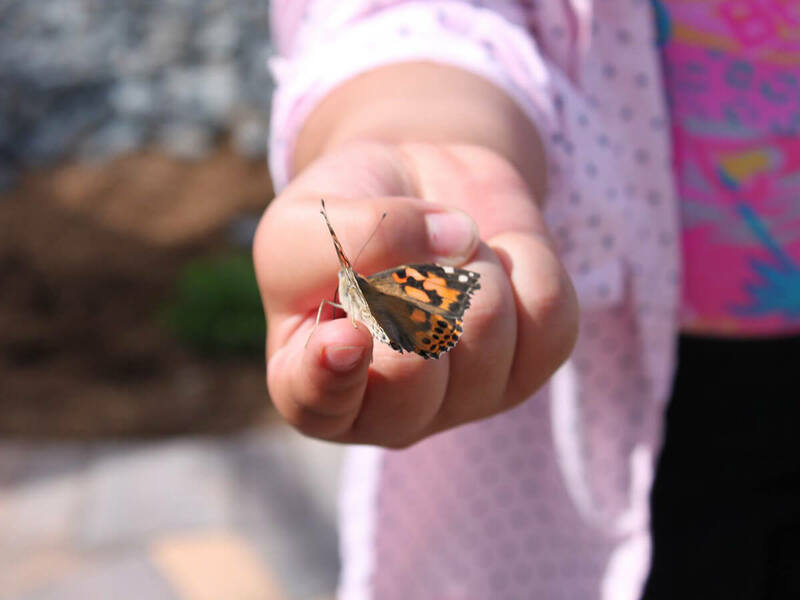 Butterfly Habitat – This seasonal exhibit located in the south end of the Botanical Garden is filled with hundreds of butterflies. It gives guests the opportunity to witness the dance between free-flying butterflies and the plants that sustain them. Open 10 a.m. - 3 p.m. daily, when weather allows, in the fall and spring. Teaching Garden – 10,000-square-feet of edible landscape and pollinator attracting plants instruct children and educators about growing food in the desert through workshops, classes and tours. Tool Shed Theater – This is a teaching area featuring an outdoor vegetable garden and displays of compost and gardening tools. Enabling Garden – This garden demonstrates options for people who have physical challenges. It features a vertical wall garden, shallow-pan gardening, raised beds, and specialty tools. Frame House – This is a partially-enclosed area featuring a kitchen with cook-top. This area is used for outdoor cooking demonstrations and similar activities. Watering Can Theater – This is an intimate outdoor amphitheater, featuring iconic irrigation components and a metal shade canopy. Landscape Retrofit – Visitors can compare water-smart landscaping to that of inappropriate landscaping for the desert, examining turf, irrigation and plant material selection. Created Wetlands – This is an overlook rest area. The aquatic flora species (rushes, sedges, and grasses) growing here clean wastewater from the Springs Preserve. The reclaimed water is not for drinking but it is used in the Preserve for irrigation and toilets. The wetland is also an ideal wildlife habitat. Gardens Amphitheater – This is a 250-seat outdoor amphitheater for garden instruction and demonstrations. Edible Gardening – This area is a fruit orchard in individual containers. There is also an herb garden demonstrating useful plants. Rose Garden Trellis – This is a beautiful shaded bench area. It is a popular spot for weddings. Cactus Gardens – This area is organized so that the visitor can see native cacti and also cacti from different regions. Palm Oasis – This area represents a dozen different palm species that grow well in arid climates. Caliche – This exhibit shows layers of caliche rock and explains its relationship to desert soils. Hardscape Examples – This display explores many paving options such as brick, stone, and treated concrete. Pathways – The walkways throughout the Gardens are paved with decomposed granite. From the beginning of the Springs Preserve, the focus has been on children and families when developing, designing, and programming activities. We offer entertaining and educational exhibits, events, programs, activities, classes and workshops for kids of all ages. Topics include archeology, animals, water, and plants. Springs Preserve train: Trains helped settle the Old West, and now they’re part of the present too! Take a 20-minute narrated ride down the Preserve’s 2.2-mile Exploration Loop Trail on our trackless train, and uncover Las Vegas history with every turn of the wheel. Look for birds and wildlife on your journey. You will see scenes of the American West, local history, ranching, water, and railroads. Boomtown 1905: Life-sized, immersive, permanent re-created historic streetscape of early Las Vegas. Visit an original cottage built by the railroad in 1910, and turn of the century (1905 – 1920) replicas of the Las Vegas Train Depot, Arizona Club, outdoor Majestic Theatre, First State Bank, Lincoln Hotel and a mercantile store. Experience life in early Las Vegas through interpretive stations and hands-on activities in each of the buildings. Live shows and demonstrations: The Springs Preserve presents live shows and demonstrations each weekend and on select holidays. The animal and science shows change every three months. Animal Shows - Our zoology staff, working with experts, trainers, and veterinarians, present live animal shows highlighting the amazing animals of the southwest. For those interested in a more hands-on experience, a backstage pass experience is available. Science Shows – Our Education staff and partner, Mad Science, present unique, natural science shows that encourage learning and audience participation. Living collections: The Origen Museum features the Living Collections exhibit where visitors are introduced to a variety of native animals. These include mammals, reptiles and invertebrates. Our exhibits show how desert animals adapt to the extreme temperatures and dry climate of the Mojave Desert. The Living Collections have desert tortoises, kangaroo rats, pocket gophers, a Gila monster, and other animals. 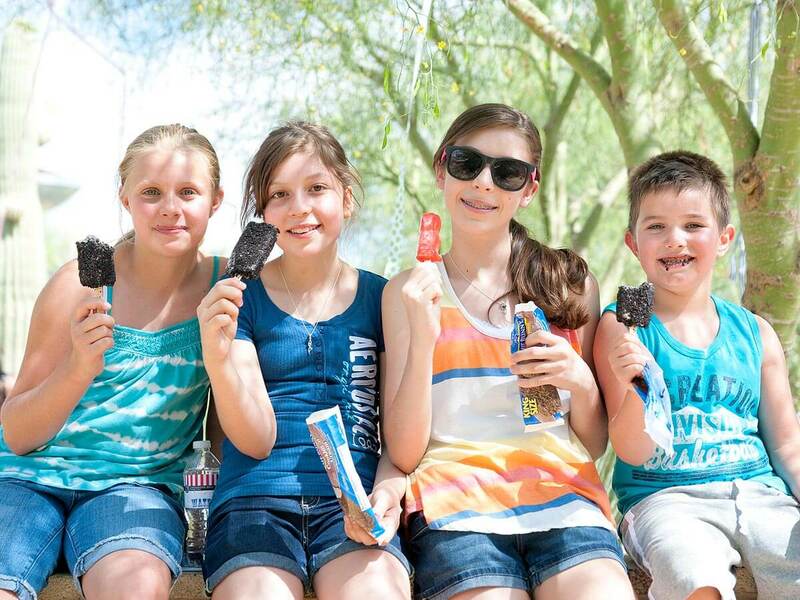 Animal feeding experiences and behind-the-scenes tours are available. Our seasonal Butterfly Habitat in the Botanical Garden is open every spring and fall. Nature Exchange: Nature Exchange is a nationwide educational program and unique learning environment located inside our Gift Shop. Young collectors can trade items they have found in nature and learn more about them. Our trained staff talks with the youngsters and encourages further investigation. Participating collectors gain points that are tracked through the Nature Exchange computer database. The children can trade their points for other items. Traveling exhibit gallery: Inside the Origen Museum, the New Frontier Gallery is a space that houses traveling exhibits of national significance. These exhibits explore topics relevant to the Springs Preserve such as science, natural history, preservation and conservation. The focus is on fun, hands-on, interactive, educational, experiences for visitors of all ages. Exhibits change approximately every three months. Children's playground: Located across from the outdoor amphitheater, the Children's Playground is currently being remodeled and will re-open fall of 2017. Classes and activities: We offer a variety of educational classes and activities for kids to help them explore and understand their desert world. Drop-in activities - These activities are available in the Origen Museum, Nature Exchange and Welcome Gallery. Topics change monthly and include desert animals, gardening, eco art, archaeology, history, storytelling, and more. Crack a geode daily or experience Mining Camp on weekends. Springs Preserve Summer Fun Camps – These camps offer kids a different adventure every week while school's out. In addition to getting a unique, in-depth experience of the Preserve with our Education staff, kids get the opportunity to have fun with our local partners for drama and science activities presented by special guests. There is even a day of swimming each week. Description: The Cienega is a 7-acre, re-created desert wetland. It is in the 25-acre, functioning Meadows detention flood basin that is found on the 180-acre Springs Preserve site. Historical background: The Springs Preserve is the site of the original springs that supplied water to ancient Native Americans and early explorers. Later, the new community of Las Vegas used this water. The water sustained meadows and thickets of mesquites and willows. When the springs dried up, much of the vegetation that relied on the water from the springs died. However, many of the trees and shrubs whose roots tapped into shallow ground water survived. Significance: The Cienega has attracted more than 30 new species of wildlife to the site, primarily birds. 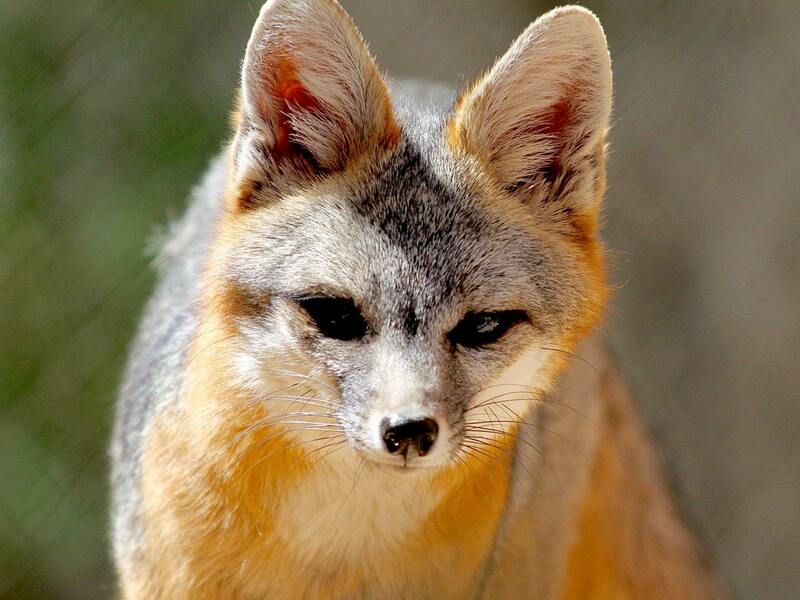 The largest wild animals recorded on site are coyote, bobcat, and gray fox. Birds species found at the Cienega include the peregrine falcon, belted kingfisher, black-crowned night heron, white-faced ibis, black-necked stilt, ruddy duck, and snowy egret. Restored vegetation now includes thriving Mojave species such as cottonwood, willow, mesquite, and acacia trees, shrubs, grasses, and aquatic species such as cattails and bulrushes. Construction overview: The Cienega restoration process began in 2003. It required the construction of several ponds and a stream. A re-vegetation process followed designed to re-create the original wetlands ecosystem that thrived on the site for thousands of years. The project included soil preparation and improvement, seeding, transplanting, plant salvaging, irrigation, and monitoring. The Cienega is self-sustaining, using ponds and a stream to capture run-off water. Nuisance water from the Alta Flood Channel is diverted into a reconstructed cauldron pool and down a stream that meanders through the detention basin. The Cienega is accessed by a trail that runs along the edge of the wetland. It includes a place for hiking, walking, docent demonstrations, and wildlife observation. Features include a stream channel, a viewing ramada, and a cauldron pool. Overview: The Desert Living Center (DLC) explores sustainable solutions to environmental challenges. It has five buildings featuring 43 exhibits, classroom and meeting spaces, and gardens. The U.S. Green Building Council (USGBC) has given the DLC Platinum certification. This is the highest Leadership in Energy and Environmental Design (LEED) level. The structures that comprise the DLC are designed, constructed and operate above the standards set forth by the LEED program. Exploration of environmentally-sound features and practices are the focus of the DLC exhibits and buildings. The DLC opened on June 8, 2007. 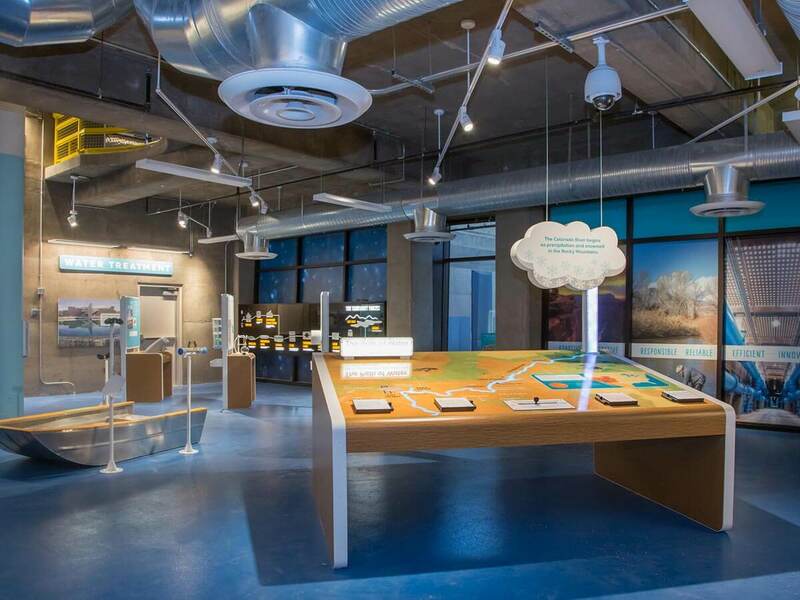 Exhibit design: Aldrich Pears Associates, Ltd.
Information Center and Gift Shop/Welcome Gallery – The DLC Welcome Gallery and Information Center is located at the heart of the Springs Preserve. At this convenient spot, visitors can purchase class tickets, sundries, souvenirs, and refreshments. Here visitors can pick up a map and talk to the knowledgeable staff about membership, activities, exhibits, and making the most of their visit. Activity Center – Classes held in this building at the northern end of the Botanical Garden inspire visitors of all ages to learn about desert gardening, nature, and much more. A truly green building, the center features rammed-earth walls, passive cooling towers, and an outdoor gathering area called the Gardens Amphitheater. Gardens Center – A place where visitors sign up and meet for classes and on select days get free advice about ailing plants by bringing in sick plants, or a photo, or a description of what ails their garden. See website for times when a Master Gardener is available to provide free plant advice and diagnosis. Kids will enjoy playing in the Garbage Truck Theater. All ages discover how to save both money and the environment in your own home with products on display in our Sustainable House exhibit. Admission: Entrance into the Origen Museum, Desert Living Center and Nevada State Museum is included with a general admission ticket. Tickets may be purchased the day of visit at the ticketing window or in advance online at springspreserve.org. General admission does not include admission to select events, concerts, performances, or classes. 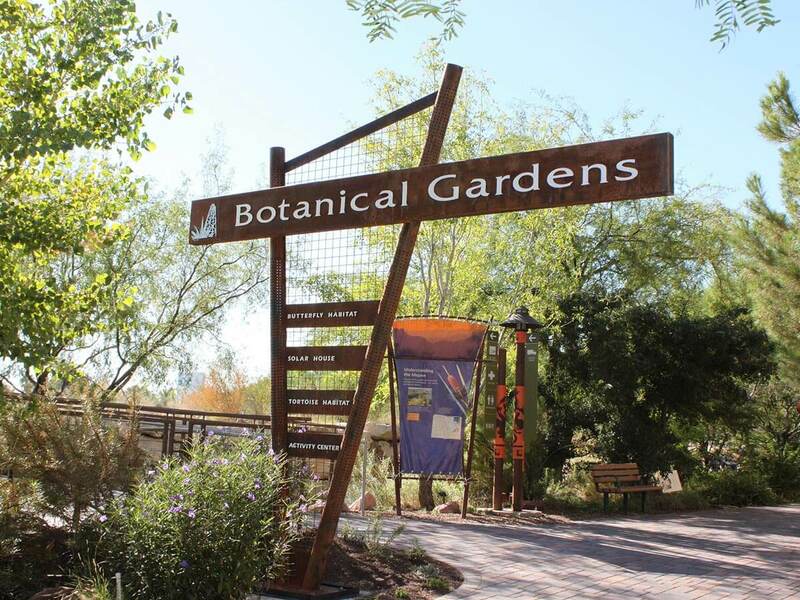 The Botanical Garden at the Springs Preserve, Trails, and Children's Play area are free with a suggested donation; however, a ticket is required for admittance. No tickets are needed to access the Divine Cafe or the Gift Shop. Guest Services – Learn about what's happening the day of your visit from Springs Preserve staff, pick up site maps, literature about upcoming events and educational classes. Rent strollers and lockers or obtain a wheelchair. Divine Cafe operated by Divine Events – With seating capacity of approximately 200, the Divine Cafe offers casual dining indoors or al fresco with a view of the Las Vegas Strip. The Cafe is open from 11 a.m. – 3 p.m. Monday through Friday, 10 a.m. - 4 p.m. on Saturday and Sunday. It has extended hours and custom menus for special events. Please visit springspreserve.org for specific details on hours of operation. Springs Preserve Gift Shop and Nature Exchange – Cultural and educational gifts, books, and souvenirs are available for purchase in the Gift Shop. The Nature Exchange is part of an international program that allows young collectors to trade naturally-found items such as shells, rocks, bark, pinecones, and more. They can earn points that can be used for trading for other items. The Gift Shop and Nature Exchange are open from 9 a.m. – 5 p.m. daily. It has extended hours for special events. Other: The Springs Preserve is wheelchair accessible. Service animals are welcome, but pets are not allowed at the Preserve to ensure visitor safety, minimize disturbance of native wildlife, and protect archeological artifacts on the site. Bicycles are available for rent on weekends and holidays at the Preserve. Personal bikes are not allowed at the Preserve. No outside food or drink is allowed into the Preserve. 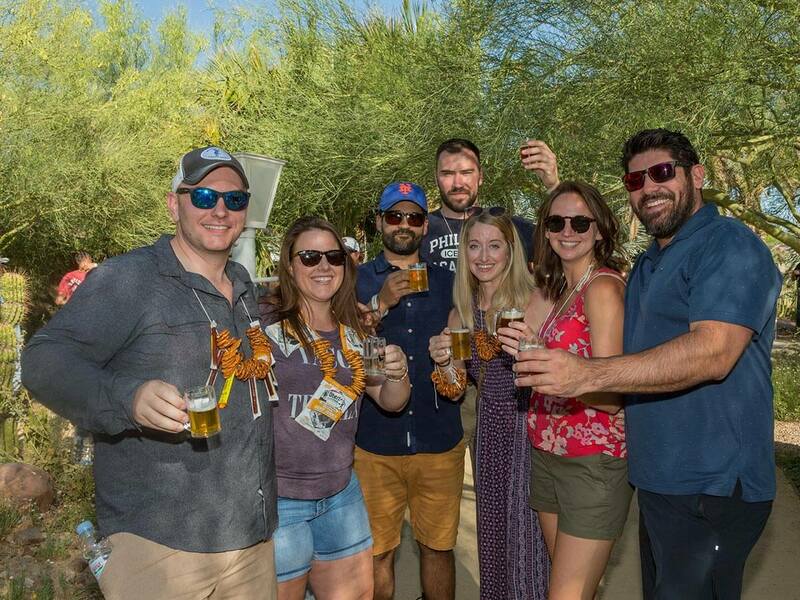 Meeting and event space: Various indoor and outdoor areas of the Preserve are available for catered meetings, corporate retreats, conventions, weddings and tour groups by calling the Group Sales department at 702-822-8779. Volunteer opportunities: The Preserve utilizes hundreds of volunteers and offers ongoing General Docent and Garden Docent training sessions. Please call 702-822-7700 for more information on volunteer opportunities. After nearly a decade of planning, utilizing guidelines created by the U.S. Green Building Council (USGBC), the buildings on the Springs Preserve (Preserve) site – designed and constructed to achieve Platinum Leadership in Energy and Environmental Design (LEED) certification – were honored with the designation in August 2008. LEED projects are rated based on a scorecard that recognizes points for the following six categories: Sustainable Sites, Water Efficiency, Energy and Atmosphere, Materials and Resources, Indoor Environmental Quality, and Innovation and Design. To achieve certification, a project must maintain stringent LEED standards in the areas of design, construction and operation. The Springs Preserve is a unique project with two LEED Platinum Certifications for the Origen Museum/Guest Services buildings as well as the Desert Living Center (DLC) buildings composing the sustainable campus. 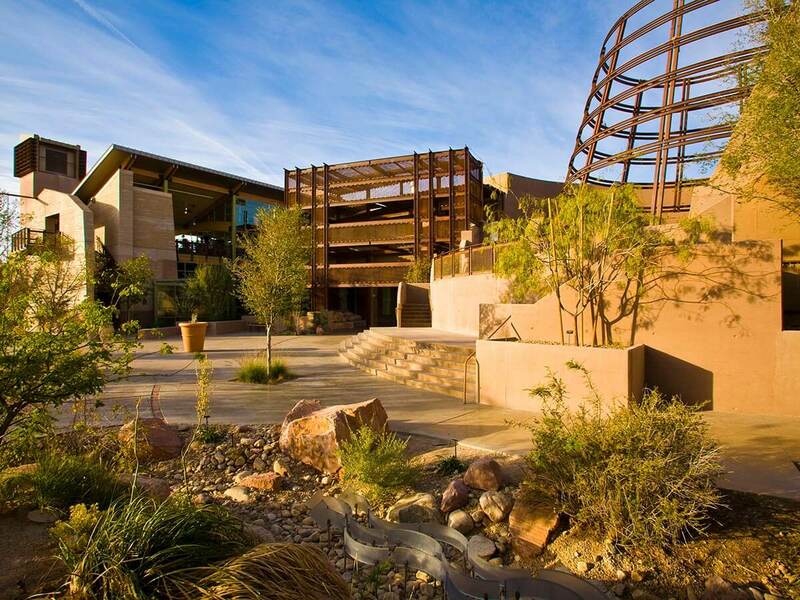 All seven buildings at the Preserve – the Origen Museum and Guest Services buildings designed by Tate Snyder Kimsey Architects and the five Desert Living Center buildings designed by Lucchesi, Galati Architects, Inc. – met strict LEED standards for certification and earned platinum grades, the highest possible score. Total square footage of Platinum LEED building space at the Preserve is 149,560. Design elements – Buildings at the Preserve are positioned to utilize natural lighting, collect solar power to heat floors and water radiantly, and contain only Low E (energy), north- and south-facing windows. Structures have been designed to take advantage of natural ventilation and several make use of entryway, overhangs and patio microclimates. Butterfly roofs on a few of the buildings help collect storm water for reuse. Reused materials - Reclaimed timber, salvaged wood from the Lucin Cutoff Trestle Bridge over which trains crossed the Great Salt Lake until the 1950’s, and glulam beams are used as primary supporting structural elements throughout the Desert Living Center. Modular carpet tile made from recycled plastic bottles and corn husks, furnishings made of recycled sunflower seed husks and countertops made from recycled paper are just a few of the recycled products utilized at the Preserve. Reclaimed steel and glass have also been used extensively throughout the project. Sustainable materials – Two buildings of the DLC totaling more than 41,000 square feet make the Preserve one of the largest commercial straw bale construction projects in the U.S. Throughout the project, locally sourced materials, such as caliche exhumed on site and rammed earth used to cover concrete stem walls, have been used as primary building elements. Operations - Water used onsite is filtered and reused to irrigate plants and flush toilets at the Preserve. Photovoltaic arrays provide a canopy of shade for visitor parking and generate approximately one-fifth of the electricity needed to power the Preserve. Evaporative cooling towers naturally funnel cool air into the DLC. Overview: The Origen Museum is a complex of galleries containing 63 permanent exhibits, an indoor theater, a traveling exhibit space, and a display area for fine art. As the focal point for history at the Preserve, the Origen Museum focuses on the natural and cultural history of the site. It highlights the Preserve’s common designation as the “birthplace of Las Vegas.” The building is Platinum LEED certified by the U.S. Green Building Council. Origen Rotunda – The entry of the Origen Museum is designed to help visitors make the most of their visit. The galleries and theater radiate off this central space. Children's drop-in classes are held here as well as receptions for special events. Art and exhibibts in the rotunda honor the organizations and individuals whose generous contributions made it possible to bring this oasis in the desert to life. Big Springs Theater – With seating for 156 people, the panoramic-style, state-of-the art theater features an eight-minute movie to introduce visitors to the Springs Preserve. The film is entitled "Miracle in the Mojave." The theater also presents educational, entertaining short films and live animal shows. During special events, the theater can show full-length feature movies. Big Springs Gallery – The revolving fine art gallery space presents a new exhibit approximately every three months. The shows concentrate on artistic works from local artist(s) or works with themes relating to Las Vegas, the Southwest, history, culture, conservation, and preservation. Natural Mojave Gallery – This gallery has both interactive and stationary exhibits. You can explore the geological and biological history of the Mojave Desert and the springs. There is also an amazing flash flood experience. 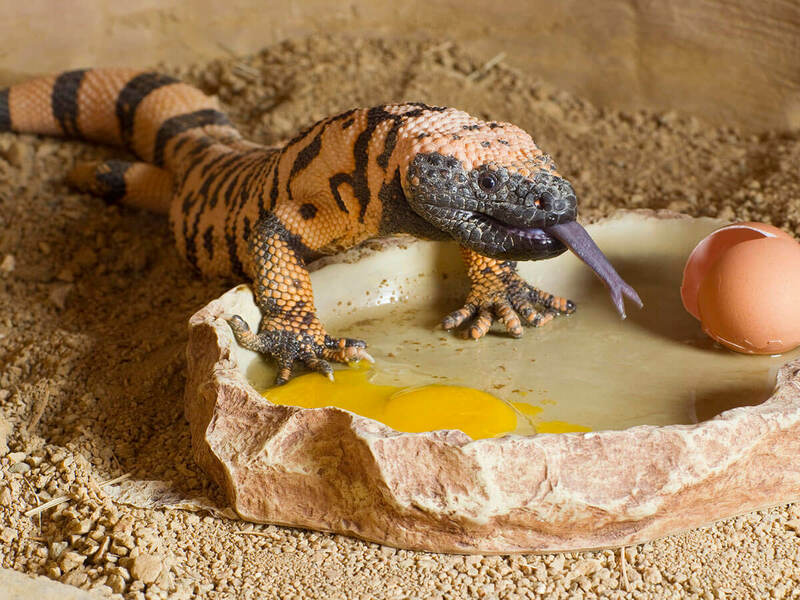 The Living Collections - Live animal exhibits feature Mojave natives who’ve adapted to arid desert conditions including a grey fox, sidewinder, Gila monsters, desert cottontails, lizards, and more. People of the Springs – The focus of this gallery is the cultural history of the Springs Preserve and the ways in which water fostered the development of Las Vegas. Visitors explore recreated native dwellings, a historic railroad car, a re-enactment of the first land auction, a Hoover Dam exhibit, and many others. Traveling Exhibit Gallery – A new exhibit with a science or natural history theme is presented in this space approximately every three months. The exhibits are both informational and entertaining for kids of all ages. The Springs Preserve offers many resources to educate us about how to live our lives in sustainable ways in the desert. There are permanent displays and exhibits throughout the facility on this topic. The Sustainability Gallery shows visitors how small changes they can make in their own homes can save precious resources and money. The Sustainable Home is a key exhibit in this Gallery. The Preserve is a living exhibit of water-efficient landscaping. There are more than 250,000 plants in 180 acres. These plants are both beautiful and sustainable. There are many examples of informal gardens and landscaping. In addition, there is a formal Botanical Garden. Educational classes and workshops are held each weekend. The topics change monthly and include such areas as desert gardening, drip irrigation instruction, energy conservation and solar options, “green” gourmet cooking, and more. The Sustainable Home – The Sustainable Home exhibit is built to look like an average house. It is in the Springs Preserve’s Desert Living Center Sustainability Gallery. This house shows how to choose and use sustainable materials. These include building materials, accessories, and furnishings. The house uses resources efficiently, particularly water and energy. Admission to the Sustainability Gallery is free for members and included with general admission. Botanical Garden at the Springs Preserve – The Botanical Garden is a beautiful learning environment. It encourages visitors to explore native and non-native desert plant life. There are many interpretive stations. There are also hands-on activities focused on water-smart landscaping. The garden boasts crushed granite paths, a bridge over a wetland area, a bench-lined rose trellis, and the Watering Can Theater along Cactus Boulevard. The visitor can also view the Frame House, which is outfitted for outdoor cooking classes and demonstrations. In the south end of the Botanical Garden, a Butterfly Habitat is open seasonally every fall and spring. The Botanical Garden is open 9 a.m. – 5 p.m. seven days a week. DesertSol – This is an award-winning solar-powered home. It is 745 square feet, with one bedroom and one bathroom. It is a permanent feature of the Botanical Garden. DesertSol is an ultra-efficient showcase of innovation in sustainable home design. It uses solar energy as its only energy source. Sustainable features of the home include solar panels, low-flow fixtures, a multi-purpose water system, remote access temperature controls, and strategic window placement promoting cross ventilation. There is even a custom screen on an outdoor deck that filters sun in the summer and retracts to allow for the warmth from the sun in the winter. DesertSol was created and built by the UNLV Solar Decathlon Team as part of the U.S. Department of Energy Solar 2013 Decathlon. 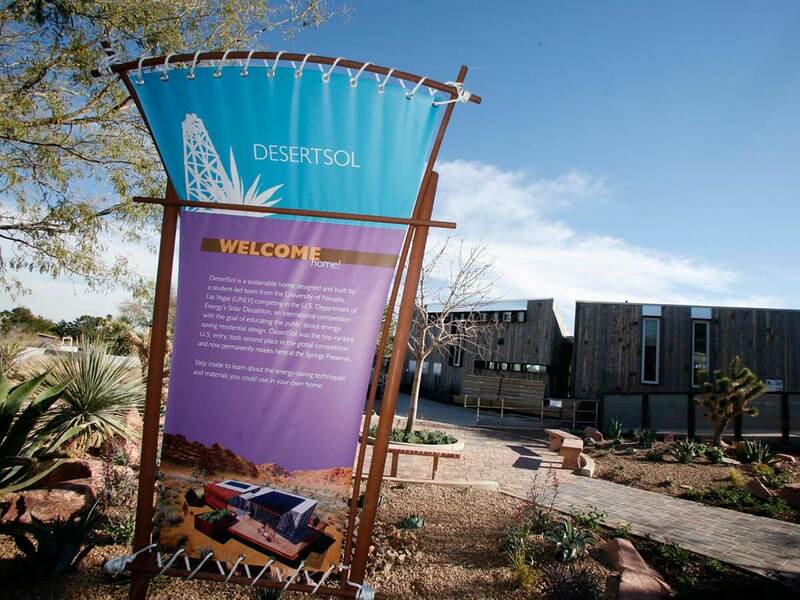 As one of the finest examples of sustainable living on the planet, DesertSol was the top-ranked entry in the United States and took second place in the global competition. Educational Programming at the Springs Preserve – The Springs Preserve offers classes and workshops revolving around green and sustainable living. Guided Botanical Garden Tours are offered every Saturday and Sunday. Drip irrigation classes and gardening classes are offered monthly in English and Spanish. Special gardening topics include desert and water-smart landscaping. The class schedule is available online at springspreserve.org under the "Events and Activities" link. Description: The trails are a treasured part of the Springs Preserve. This area has been left largely undeveloped to preserve archaeological and historical objects. It also provides habitat for local and migrating wildlife. The trails introduce visitors to unique and historic features. These include a desert wetlands area (Cienega), a spring mound, and two springhouses. There are additional archaeological areas that offer a glimpse into the history and pre-history of the Las Vegas Valley. Waysides and ramadas (covered areas along the trails) offer information on early adobe structures, well derricks, plants, animals and prehistoric artifacts. 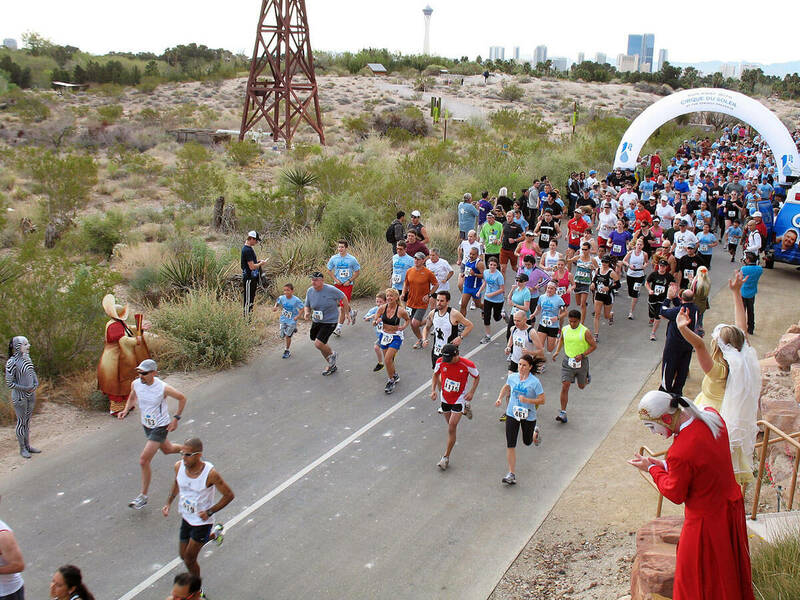 One quarter mile along the Exploration Loop Trail, the WaterWorks museum and functioning water pumping station is located, as is Boomtown 1905 offering an immersive, life-sized experience of an early Las Vegas streetscape and fully restored, authentic railroad cottages. Size: The four trails total nearly four miles accessible to hikers and bicycles. Of that, over two and a half miles are also accessible to wheelchairs. Crossroads Trail is about two-thirds of a mile of loose gravel. It has a moderate incline to the Spring Mound and is for walkers and hikers only. This trail exhibits a 10,000-year-old spring mound which is one of the few remaining in the Las Vegas Valley. This important geologic remnant still holds many significant prehistoric artifacts. Informative signs near a historic springhouse provide visitors with information on the cultural stories of the site. Other features of the trail include historic adobe and derrick structures, plant recognition waysides, Big Spring Springhouse interpretive station, and the Las Vegas Valley plant communities' ramada. Springs Trail is nearly half a mile of partially paved trail. It includes a restroom stop. Exhibits on this trail explore the various cultural communities that have occupied the site, the materials they relied on for survival, and how they adapted to desert life. Elements include a prehistoric pithouse interpretive station, an outdoor classroom, the Chicken Coop wayside, Boy Scout chimney and Caretaker’s House, a shanty and settling basin, a historic dugout, and a rare plant and animal wayside. Cienega Trail is a third of a mile of loose gravel for walkers and hikers only. There is a seven-acre, recreated desert wetland. This trail provides visitors with opportunities to view wildlife in its native environment. It runs along the western edge of the wetland and includes places for hiking, walking, demonstrations, and wildlife observation. Exploration Loop Trail is about two and a quarter miles of paved trail. It is partially accessible via train and open to bicycles, hikers, and wheelchairs. Following the northern perimeters of the Preserve on this trail, visitors experience WaterWorks, Boomtown 1905, and interpretive ramadas that highlight 100’s of years of history of Las Vegas. The trail educates visitors on the historic routes that Native Americans and early pioneers used to access the springs. A trackless train makes its way around the trail daily to and from Boomtown 1905 and for 20-minute rides around the full trail daily. Check with our ticket window for train schedules.